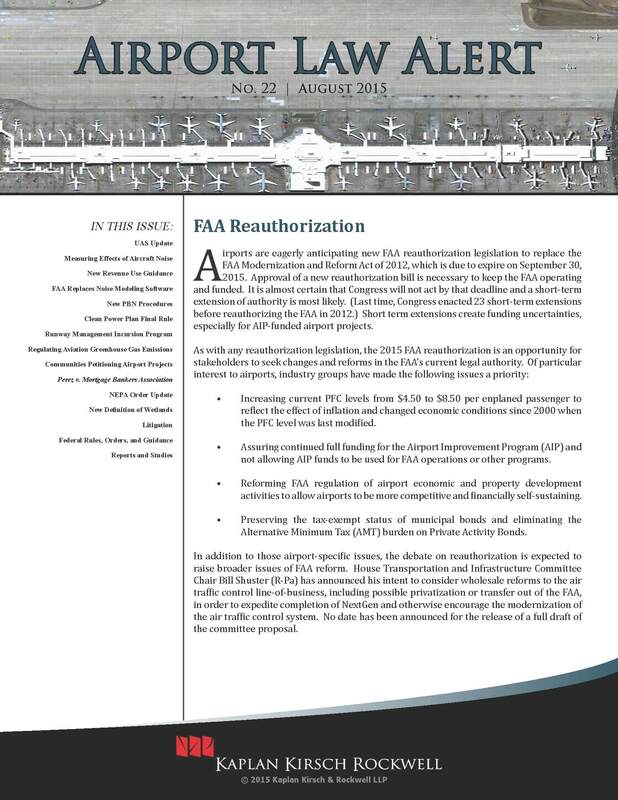 Airports are eagerly anticipating new FAA reauthorization legislation to replace the FAA Modernization and Reform Act of 2012, which is due to expire on September 30, 2015. Approval of a new reauthorization bill is necessary to keep the FAA operating and funded. It is almost certain that Congress will not act by that deadline and a short-term extension of authority is most likely. (Last time, Congress enacted 23 short-term extensions before reauthorizing the FAA in 2012.) Short term extensions create funding uncertainties, especially for AIP-funded airport projects. Increasing current PFC levels from $4.50 to $8.50 per enplaned passenger to reflect the effect of inflation and changed economic conditions since 2000 when the PFC level was last modified. Assuring continued full funding for the Airport Improvement Program (AIP) and not allowing AIP funds to be used for FAA operations or other programs. Reforming FAA regulation of airport economic and property development activities to allow airports to be more competitive and financially self-sustaining. Preserving the tax-exempt status of municipal bonds and eliminating the Alternative Minimum Tax (AMT) burden on Private Activity Bonds. In addition to those airport-specific issues, the debate on reauthorization is expected to raise broader issues of FAA reform. House Transportation and Infrastructure Committee Chair Bill Shuster (R-Pa) has announced his intent to consider wholesale reforms to the air traffic control line-of-business, including possible privatization or transfer out of the FAA, in order to expedite completion of NextGen and otherwise encourage the modernization of the air traffic control system. No date has been announced for the release of a full draft of the committee proposal. In the months since the FAA announced the start of a rulemaking process to address the commercial use of small unmanned aircraft systems under 55 pounds (sUAS), demand for exemptions under Section 333 of the FAA Modernization and Reform Act of 2012 allowing the immediate use of sUAS has grown by leaps and bounds. In response, the FAA has streamlined the process for obtaining an exemption for commercial operations and granted hundreds of exemptions. The interim process still requires a case-by-case review of proposed operations, but relaxes previously-applicable restrictions. Until a final sUAS rule is adopted, the interim streamlined review provides the means by which persons seeking to use sUAS for commercial purposes can obtain authorization to legally operate their devices. Stay certain distances away from airports or heliports. One important operational change is the elimination of most geographical restrictions on COAs for sUAS. COAs issued under the interim process allow authorized operators to fly sUAS at or below 200’ above ground level anywhere in the country except in restricted airspace and other areas where the FAA prohibits sUAS operations, such as over major cities. This revised approach provides a great deal of flexibility to users such as real estate agents, property managers, surveyors, public utilities, still and video photographers, and agricultural producers to use sUAS where they wish outside of restricted areas. Of particular interest to airport operators, exemptions granted since the spring of 2015 typically include a requirement that, if within the exclusion radii surrounding the airports, the sUAS operator must enter into an agreement with the airport for operations. As the use of sUAS proliferates, airport operators and local governments will likely face increasing pressure to regulate sUAS to address privacy, noise, land use, and other local concerns. Firm partner Allison Fultz recently published an article discussing the particular issues sUAS pose for airport operators and local governments. More information about the streamlined interim process can be found on FAA's website. On May 7, 2015, the FAA announced that it was beginning work on a multi-year study to update the scientific evidence on the relationship between aircraft noise exposure and its effects on communities. The FAA intends to conduct surveys of residents near 20 airports across the country in order to survey public perception of aircraft noise. The FAA states that this will be the most comprehensive single aircraft noise survey conducted in the United States. The FAA did not identify the communities to be surveyed in order to preserve the scientific integrity of the surveys. The FAA expects the surveys to be completed by the end of 2016. After that, the FAA will analyze the data to assess whether to update the FAA’s guidelines and methodology for determining exposure to aircraft noise. Since 1981, the FAA has relied on the DNL 65 decibel noise exposure level for its environmental review process and to make funding decisions for most noise projects near airports and for federal approval of noise abatement and mitigation measures pursuant to Part 150 and Part 161. The DNL metric is based on an average of all community noise over a 24-hour period, with nighttime noise weighted by a factor of 10 to account for the disruptive effects of nighttime noise. Use of the DNL 65 decibel guideline has not been without controversy, however, and a number of communities and stakeholders have urged the use of a methodology other than DNL and/or the use of a lower DNL decibel level. A change in the current 65 DNL decibel guideline could have significant impacts on airport operators. The use of a different noise metric or DNL threshold could increase or decrease the number of homes eligible for federally funded acoustic treatment, home-buyouts, or other noise mitigation measures; could change mitigation obligations; and could change the scope of environmental reviews. In addition to federal issues, a new federal guideline, and publication of the survey results supporting the new guideline could affect airport operators under state lawsuits for inverse condemnation, trespass, and nuisance. In November 2014, the FAA released an amendment to its Policy and Procedures Concerning the Use of Airport Revenue making explicit that the revenue use laws and policies apply to all taxes on aviation fuels, even if not imposed or collected by an airport sponsor. This amended policy is of great interest to airport sponsors because it potentially provides an important stream of additional state and local revenue to fund capital and operating needs. The FAA has emphasized that the Policy amendment does not reflect new policy or law but is intended to remind local and state governments of their obligations under long-standing federal law. Under federal law, all taxes on aviation fuels must be used for airport purposes or state aviation programs. The clarification set forth in the amended Policy makes non-sponsors subject to revenue use obligations, and potentially subject to severe penalties for impermissible use of fuel taxes. Although the amended Policy makes clear that airport sponsors are not responsible for assuring compliance by non-sponsors—their obligations are discharged by informing non-sponsors of their obligations—the amended Policy is designed to remind many states and local governments of their accounting obligations because taxes on aviation fuels are often included in general sales or excise tax collections and are often dedicated to specific non-aeronautical uses under state law. In response to a request for clarification from the National Association of State Aviation Officials (NASAO), the FAA provided additional guidance on the Policy. The FAA explained how it was going to interpret issues such as grandfathered taxes (those in effect before December 1987); how non-sponsors need to come into compliance with federal law; and how states can use offsets against other aviation expenses rather than directly dedicate fuel taxes to aviation. On May 29, 2015, the FAA announced that it was replacing the separate modeling software packages used to analyze aircraft noise, fuel burn, and emissions with a single modeling software package called the Aviation Environmental Design Tool (AEDT), version 2b. AEDT replaces the separate modeling tools for aircraft noise (the Integrated Noise Model) and air emissions (the Emissions and Dispersion Modeling System). The FAA will require the use of AEDT ver. 2b to analyze aircraft noise, fuel burn, and emissions for purposes of environmental analysis under NEPA for analyses begun after May 29, 2015. Projects for which environmental analysis began before May 29 may continue to use the older modeling tools. AEDT is not expected to result in material changes in the environmental analysis of airport projects. Additional information is available on the FAA’s AEDT Support web page. Optimization of Airspace and Procedures in the Metroplex (NorCal OAPM). Lyons, et al. v. FAA, Case No. 14-72991 (9th Cir. Filed Sept. 26, 2014). The City of Phoenix recently challenged PBN procedures in the Phoenix airspace. City of Phoenix v. Huerta, Case No. 15-1158 (D.C. Cir. Filed June 1, 2015). Both cases are pending. Revising the FAA Community Involvement Manual to include current requirements, best practices, lessons learned, and technological aids to improve community outreach. Developing a community involvement plan to determine the appropriate level of community notification and involvement for each airspace matter identified in FAA Order 7400.2, Procedures for Handling Airspace Matters, Chapter 32, Appendix 10. Developing improved procedures under FAA Order 7100.41, PBN Implementation Process, to assure that key airport staff are involved in the development of PBN procedures and community outreach strategies. Involving airports in the Air Traffic Initial Environmental Review as part of the Order 7100.41 and Order 7400.2 process to identify potential environmental issues, potentially affected individuals, officials, community groups, or others who may be affected by, or have an interest in, the new procedures. Forming a Noise Complaint Initiative to identify ways the FAA can address noise complaints in a clear, consistent, and repeatable manner. The FAA did not set a schedule or specific process for implementing these changes. A copy of the FAA’s Responses to the NextGen Advisory Committee is available on RTCA's website, under General, 2015 Meetings. On August 3, 2015 President Obama and the Environmental Protection Agency announced the Clean Power Plan Final Rule with its aim on the problem of climate change. Broadly, it aims to cut carbon emissions from power plants across the U.S. by 32% of 2005 levels by 2030. It directly targets carbon emissions from power plants, which are the largest carbon emitters. It places mandatory carbon reduction targets for each state to meet, but allows states flexibility in achieving the targets. Among various tools to meet these reduction requirements, the Clean Power Plan encourages expanded use of renewable energy and energy efficiency, and to a lesser extent efficient gas-fired energy. States can elect to address their reduction targets using an individual or a multi-state regional approach. electricity generated by on-airport solar, co-generation and other projects more cost competitive. It is also possible that the number of proposed wind and concentrated solar energy projects near airports may increase to meet increased demand for larger-scale renewable energy. On June 3, 2015, the FAA announced the start of a 10-15 year Runway Incursion Management (RIM) Program to develop methods to reduce the risk of runway incursions based on risk-based decision-making. The FAA is rolling out the program at a number of airports across the country with a past history of runway incursions. The program will focus on specific locations where incursions have occurred in order to identify specific risk factors that might contribute to a runway incursion and develop strategies to help airport sponsors mitigate those risks. The FAA states that the RIM Program is the next step in its long-term program to reduce airfield safety risks. Additional information is available on the FAA's website. Organization’s (ICAO) process for setting international standards for CO2 emissions from aircraft. This announcement is the first step in the process that would allow EPA to adopt the ICAO standard when it is promulgated. The EPA will be taking comments on these proposals for 60 days. Additional information is available on EPA's website. On August 4, 2015, the FAA announced proposed guidance on the procedures for communities affected by a new airport, a new or relocated runway, or a major runway extension to petition the FAA directly concerning the project. The proposed procedures implement 49 U.S.C. § 47106(c)(1)(A)(ii), which allows communities affected by those projects to petition the Secretary if the community does not have voting representation on the airport’s managing board. Although the petition procedure has been used only infrequently, the FAA determined that it would be helpful to provide the public with guidance on the procedures for filing a petition. In addition to setting out the procedural requirements for submitting a petition, the FAA’s proposal provides that the right of petition only applies to the community in which the project will be physically located or where there are significant impacts. The FAA is accepting comments on the proposed procedures for 60 days. On March 9, 2015, the Supreme Court announced its decision in Perez v. Mortgage Banker’s Assn., holding that an administrative agency does not have to go through notice-and-comment rulemaking procedures to promulgate an interpretive rule that differs significantly from previous interpretations. The decision reversed nearly 20 years of precedent from the Court of Appeals for the District of Columbia under the so-called Paralyzed Veterans doctrine which held that new interpretive rules that changed the substance of prior rules were required to follow notice and comment procedures on the theory that a new interpretive rule was the same as a new substantive rule. See Paralyzed Veterans of America v. D.C. Arena L.P., 117 F. 3d 579 (D.C. Cir. 1997). A unanimous Supreme Court overturned the Paralyzed Veterans doctrine, finding that Section 4 of the Administrative Procedures Act "specifically exempts interpretive rules from the notice-and-comment requirements that apply to legislative rules." The Court stated that the Paralyzed Veterans doctrine was a "judge-made procedural right" that was contrary to a plain reading of Section 4. It is important to note that Mortgage Bankers declined to address the definition of "interpretive rule," leaving untouched the broad discretion of an agency to determine whether a rule is interpretive or legislative under current law. The impact of this case on airports could be significant, and has been widely interpreted to expand executive administrative authority and reduce transparency in the rulemaking process. The FAA subjects relatively few of its actions to formal notice-and-comment rulemaking and instead prefers to issue policy documents, opinions, guidance letters, advisory circulars and internal orders which may or may not be released in draft form before becoming final. As a result of this ruling, the FAA may now significantly change its interpretation of its own regulations without a notice-and-comment period, allowing new interpretations to take effect immediately and without prior notice or vetting by stakeholders. Mortgage Bankers could allow the FAA to implement significant new policies with little or no opportunity for comment. On July 24, 2015, the FAA released a revised version of its Order regarding Environmental Impact: Policies and Procedures, FAA Order 1050.1F, which replaces Order 1050.1E. Order 1050.1F provides direction to FAA personnel on how to prepare environmental documents in order to comply with NEPA. The FAA is also in the process of updating FAA Order 5050.4B, NEPA Implementing Instructions for Airport Actions, and the Environmental Desk Reference for Airport Actions, to reflect the changes to Order 1050.1F. Includes sections on the environmental review appropriate for NextGen-related actions. Clarifies the FAA’s responsibilities and the role of applicants and contractors and the role of states in the State Block Grant Program. Clarifies which projects warrant environmental monitoring for purposes of mitigation and the type and extent of monitoring. Adds a discussion of Environmental Management System and its application to all FAA programs, including NextGen. Identifies actions that normally require an EA, including new actions such as the establishment or modification of an Instrument Flight Rules Military Training Route and the approval of formal and informal runway use programs that may significantly increase noise over noise sensitive areas. Identifies actions that normally require an EIS. Adds national marine sanctuaries and wilderness areas to the list of resources that must be considered in evaluating actions for extraordinary circumstances that would preclude the use of a CATEX for a proposed action. Changes the CATEX process by updating the CATEX documentation requirements and adding to and amending the list of actions that ordinarily qualify for a CATEX. Requires language in notices soliciting public comment on draft EAs and draft EISs stating that personal information provided by commentators may be made publicly available. Explains under what conditions the FAA may terminate the preparation of an EIS. Clarifies and expands on requirements relating to FAA adoption of other agencies’ NEPA documents. Updates and clarifies emergency actions. The Environmental Protection Agency (EPA) and the Army Corps of Engineers (CORPs) recently issued a new rule defining "waters of the United States" (WOTUS) under the Clean Water Act (CWA). The Rule will become effective on August 28, 2015. The purpose of the Rule is to codify historical and current agency practices in determining which waters and wetlands are regulated under the CWA by virtue of being "waters of the United States." After years of uncertainty and extensive litigation over the meaning and scope of WOTUS, the Rule is intended to establish definitive categories of WOTUS and provide clarity and predictability in determining jurisdictional waters. The EPA and Corps state that Rule narrows the scope of the existing definition of WOTUS—and therefore limits the scope of waters regulated under the CWA—due to new explicit limitations on certain waters. The Rule establishes jurisdiction for two types of waters: 1) waters that are always jurisdictional, such as interstate waters, and 2) a narrower category of waters that require a case-specific analysis to determine whether they have a significant nexus to other WOTUS. The Rule also includes bright line, geographic boundaries for certain waters that are intended to simplify a WOTUS determination. The Rule newly codifies multiple exclusions to CWA jurisdiction. The former rule only expressly excluded waste treatment systems and prior converted cropland from WOTUS. The new Rule adds, among others, exclusions for stormwater control features constructed in dry land, ditches that are not a relocated tributary or excavated in a tributary, and artificial lakes and ponds constructed in dry lands. Also, for the first time, groundwater is expressly excluded from the definition of WOTUS. Whether the Rule results in significant changes in the scope of CWA jurisdiction will be played out through its practical application in the field and through litigation in the courts. 27 states filed legal challenges to the Rule within two days of the Rule’s June 29, 2015 publication in the Federal Register, and a coalition of industry and trade groups filed an additional challenge shortly thereafter. If upheld by the courts, the new regulations should ease permitting requirements for airport projects that require construction or modification of storm water control features, retention ponds, and similar facilities that are excluded from permitting requirements under the new regulations. Pofolk Aviation Haw., Inc. v. DOT for the State, No. 13-0003857 (Haw. June 29, 2015) (affirming state DOT’s authority to impose reasonable landing fees at federal airfields, insofar as they do not interfere with federal operations and are not considered a "rule" for the purpose of the statute). Friends of the E. Hampton Airport, Inc. v. Town of E. Hampton, No. 15-CV-2246 (E.D.N.Y. June 26, 2015) (denying preliminary injunctions for two flight curfew ordinances, issuing preliminary injunction for once a week flight ordinance). Citizens for Quiet Skies v. Mile-Hi Skydiving Center, Inc., No. 13-CV-31563 (Boulder Cnty, CO Dist Ct. May 21, 2015) (denying nuisance and negligence claims arising from over flights by skydiving operator). BRRAM, Inc. v. FAA, No. 14-02686 (D.N.J. May 18, 2015) (dismissing claims that failure to conduct noise analysis for new flight routes violated NEPA). Bakers Constr. Servs. v. Greeneville-Greene Cnty. Airport Auth., No. E2014-01395 (Tenn. Ct. App. May 14, 2015) (affirming breach of contract when airport failed to secure rights-of-way for runway expansions yet demanded work to proceed subject to Federal American Recovery and Reinvestment Act deadline). Rogers v. Louisville-Winston County Airport Auth., 2015 U.S. Dist. LEXIS 41692 (N.D. Miss. Mar. 31, 2015) (finding qualified immunity for airport officials who were sued for violating due process and equal protection rights when denying hangar space to individual). Airlines for America v. TSA, No. 14-1143 (D.C. Cir. March 10, 2015) (affirming TSA regulation assessing security fee on the domestic leg of a one-way, multi-leg flight that originated overseas). National Federation of the Blind v. FAA, No. 14-00085 (D.D.C. Jan. 28, 2015) (transferring case to D.C. Circuit, which has asserted jurisdiction to review final rule as a final "order" under 49 U.S.C. §46110). Boch v. Tomassian, No. 13 MISC 475253 (Mass. Land Ct. 2015) (affirming zoning board’s authority to regulate helicopter landings on private land even when ordinance is not approved by the state aeronautics board; furthermore helipads are not a customary accessory use to residential property). Matter of Committee to Stop Airport Expansion v. Wilkinson, 126 A.D.3d 788 (N.Y. App. Div. 2d Dep’t 2015) (affirming Town of East Hampton’s fulfilling of state NEPA requirements for its Master Plan and Airport Layout Plan updates). In re: Changes in Physical Structures & Use at Burlington Int’l Airport for F-35A, 2015 VT 41, (Vt. 2015) (affirming Vermont Environmental Division decision that state land-use permitting statute does not apply to the construction of a U.S. Air National Guard installation at Burlington International Airport because it is not for "state purposes"). Tulsa Airports Improvement Trust v. United States, 120 Fed. Cl. 254 (Fed. Cl. 2015) (finding no subject matter jurisdiction for dispute over FAA noise abatement grants under the Tucker Act, and transferring matter to the 10th Circuit). Dep’t of Homeland Sec. v. MacLean, 135 S. Ct. 913 (U.S. 2015) (establishing that TSA agents may only be dismissed for disclosures prohibited by statute but not those barred in regulations). City of Phoenix v. Huerta, No. 15-1158 (D.C. Cir. Filed June 1, 2015) (challenging RNAV procedures in Phoenix). City of Mukilteo v. Snohomish County, No. 15-2-06802-4SEA (Wa. Super. Ct. filed March 22, 2015) (claiming county violated State Environmental Protection Act by not conducting environmental review prior to entering into lease option with developer). Lyons, et al. v. FAA, No. 14-72991 (9th Cir. Filed Sept. 26, 2014) (challenging FAA’s approval of RNAV procedures in Northern California). Corr v. Metropolitan Washington Airports Authority, Petition for Writ of Certiorari, No. 13-1559 (U.S. filed Jun. 11, 2014) (court has taken additional briefing on question of whether the MWAA compact violates separation of powers as an inappropriate delegation of Executive authority). City of Santa Monica v. United States, No. 14-55583 (9th Cir. filed Apr. 11, 2014) (appeal from ruling that City’s quiet title action for property underlying airport was barred by statute of limitations). Director’s Determination, Tropical Aviation Ground Services, Inc. v. Broward County, FL, FAA Docket No. 16-12-15 (April 27, 2015) (airport operator not in violation of Assurances 22, 23, 24, 30, 37, or 39 for refusing to renew lease with air carrier and actions to enforce local ordinances related to derelict aircraft). Director’s Determination, Virginia One Dev., Inc. v. City of Atlanta, GA, FAA Docket No. 16-12-09 (Jan. 26, 2015) (airport operator did not violate Assurances 5, 16, 21, or 35 by not acquiring property identified on the airport Noise Exposure Map as being impacted by aircraft noise). Final Agency Decision and Order, McDonough Properties, L.L.C. v. City of Wetumpka, AL, FAA Docket No. 16-12-11 (Jan. 15, 2015) (affirming Director’s Determination dismissing claims under Assurances 22, 23, and 24 challenging airport operator’s decision to renew leases for a one-year tier only pending possible closure of the airport). Final Rule, Nondiscrimination on the Basis of Disability in Programs or Activities Receiving Federal Financial Assistance (U.S. Airports), 80 Fed. Reg. 46508 (Aug. 5, 2015) (amending 49 CFR Part 27 to add provisions requiring obligated airports with more than 10,000 annual enplanements to provide service animal relief areas, captioning of televisions and audio-visual displays, and passenger lifts for international flights). Addendum to AC 150/5345-53D Airport Lighting Equipment Certification Program (July 17, 2015). Notice, Stage 3 Compliance for Jets Weighing 75,000 Pounds or Less After December 31, 2015, 80 Fed. Reg. 42,021 (July 16, 2015). Notice of Petition; request for comments, Petitions for Rulemaking: Aircraft Owner and Pilots Association to Amend FAA Policy Concerning Flying Club Operations at Federally-Obligated Airports, 80 Fed. Reg. 41,447 (July 15, 2015). Errata Sheet for Advisory Circular 150/5370-10G, Standards for Specifying Construction of Airports (July 13, 2015). Change 1, AC 150/5100-14E - Architectural, Engineering, and Planning Consultant Services for Airport Grant Projects (proposed update to procedures by which airport operators may procure professional services). Draft AC 150/5300-19, Airport Data and Information Program (June 12, 2015). Advisory Circular No. 150/5210-17C+, Programs for Training of Aircraft Rescue and Fireighting Personnel (June 12, 2015). Notice of Proposed Rulemaking, Changes to the Application Requirements for Authorization to Operate in Reduced Vertical Separation Minimum Airspace, 80 Fed. Reg. 30,394 (May 28, 2015). Direct Final Rule; Prohibition of Fixed-Wing Special Visual Flight Rules Operations at Washington-Dulles International Airport; Withdrawal, 80 Fed. Reg. 28,538 (May 19, 2015). Notice of Proposed Rulemaking, Operation and Certification of Small Unmanned Aircraft Systems, 80 Fed. Reg. 9,544 (Feb. 23, 2015). Final Rule, New York North Shore Helicopter Route, 80 Fed. Reg. 8,242 (Feb. 17, 2015). Advisory Circular No. 150/5070-6B, Change 2 to Airport Master Plans (Jan. 27, 2015). Policy, U.S. State Safety Program, National Transportation Safety Board & Federal Aviation Administration (Jan. 27, 2015). Notice of Proposed Rulemaking, Slot Management and Transparency: LaGuardia John F. Kennedy International and Newark Liberty International Airports, 80 Fed. Reg. 1,274 (Jan. 8, 2015). Proposed Rule, Endangered and Threatened Wildlife and Plants; Revisions to the Regulations for Petitions (May 21, 2015). Draft Guidance: Social Cost of Carbon in NEPA (Dec. 2014). Federal Aviation Administration, The Economic Impact of Civil Aviation on the U.S. Economy (Jan. 2015). Aviation Security: TSA Has Taken Steps to Improve Vetting of Airport Workers, GAO-15-704T (Jun. 2015). Airport Finance: Information on Funding Sources and Planned Capital Development, GAO-15-306 (Apr. 2015). Airport Funding: Changes in Aviation Activity Are Reflected in Reduced Capacity Concerns, GAO-15-498T (Apr. 2015). Commercial Aviation: Raising Passenger Facility Charges Would Increase Airport Funding, but Other Effects Less Certain, GAO-15-107 (Dec. 2014). Synthesis 67: Airside Snow Removal Practices for Small Airports with Limited Budgets (Jul. 2015). Synthesis 66: Lessons Learned from Airport Sustainability Plans (Jul. 2015). Synthesis 65: Practices to Develop Effective Stakeholder Relationships at Smaller Airports (Jul. 2015). Report 140: Guidebook on Best Practices for Airport Cybersecurity (Jul. 2015). Report 138, Volume 1: Preventive Maintenance at General Aviation Airports Volume 1: Primer (Jul. 2015). Report 138, Volume 2: Preventive Maintenance at General Aviation Airports Volume 2: Guidebook (Jul. 2015). Report 136: Implementing Integrated Self-Service at Airports (Jul. 2015). Synthesis 64: Issues Related to Accommodating Animals Traveling Through Airports (Jun. 2015). Synthesis 62: Cell Phone Lots at Airports (Jun. 2015). Report 139: Optimizing Airport Building Operations and Maintenance Through Retrocommissioning: A Whole-Systems Approach (Jun. 2015). Report 137: Guidebook for Advancing Collaborative Decision Making (CDM) at Airports (Jun. 2015). Report 135: Understanding Airport Air Quality and Public Health Studies Related to Airports (Jun. 2015). Report 134: Applying Whole Effluent Toxicity Testing to Aircraft Deicing Runoff (Jun. 2015). Synthesis 63: Overview of Airport Fueling Operations (May 2015). Synthesis 61: Practices in Preserving and Developing Public-Use Seaplane Bases (May 2015). Synthesis 60: Airport Emergency Post-Event Recovery Practices (May 2015). Report 132: The Role of U.S. Airports in the National Economy (May 2015). Report 131: A Guidebook for Safety Risk Management for Airports (May 2015). Report 130: Guidebook for Airport Terminal Restroom Planning and Design (May 2015). Legal Research Digest 24: Sovereign Immunity for Public Airport Operations (Apr. 2015). Report 118: Integrating Aviation and Passenger Rail Planning (Apr. 2015). Report 133: Best Practices Guidebook for Preparing Lead Emission Inventories from Piston-Powered Aircraft with the Emission Inventory Analysis Tool (Mar. 2015). Report 129: Evaluating Methods for Counting Aircraft Operations at Non-Towered Airports (Mar. 2015). Report 128: Alternative IT Delivery Methods and Best Practices for Small Airports (Mar. 2015). Report 127: A Guidebook for Mitigating Disruptive WiFi Interference at Airports (Mar. 2015). Report 124: Airport Parking Garage Lighting Solutions (Mar. 2015). Legal Research Digest 23: A Guide for Compliance with Grant Agreement Obligations to Provide Reasonable Access to an AIP-Funded Public Use General Aviation Airport (Feb. 2015). Report 126: A Guidebook for Increasing Diverse and Small Business Participation in Airport Business Opportunities (Jan. 2015). Report 125: Balancing Airport Stormwater and Bird Hazard Management (Jan. 2015). Report 123: A Guidebook for Airport Winter Operations (Jan. 2015). Report 122: Innovative Airport Responses to Threatened and Endangered Species (Jan. 2015).